I’ve been meaning to post up details of this cycle for a long time and cycling it recently has finally given me incentive to do so. This 34 Mile/ 54 K route is very difficult on the legs for for the cyclist with a sense of adventure you will not be disappointed by one of the most scenic and beautiul parts of Ireland. The cycle leaves Killarney and heads out the Killorglin road for approximately 3 miles where you take a left road that is signposted for the Gap of Dunloe and Kate Kearney’s Cottage. From here the road narrows considerably and this is the Gap of Dunloe, known as the Gap for obvious reasons as it lies in a valley inbetween two mountains of the Macgillycuddy Reeks. This is where the real cycle begins and is almost like a journey to historic Ireland, little or no traffic except the odd horse and cart, little in the way of Telephone wires and offers lots of peace and quite. The road here is undulating and meanders both up and down and left and right which can hurt the legs on ascent and free you on descents. This is the general situation with the roads for approximately another 13 miles and includes a very difficult steep section with reaches 14.6% in some places, but the route is worth it, try to conserve some energy here you will need it for later. The fact that I said you are cycling in a valley, you might have guessed this means that there are two climbs. The second is Molls Gap but an alternative route on it’s ascent which climbs very quickly over a shorter distance than the traditional ascent. 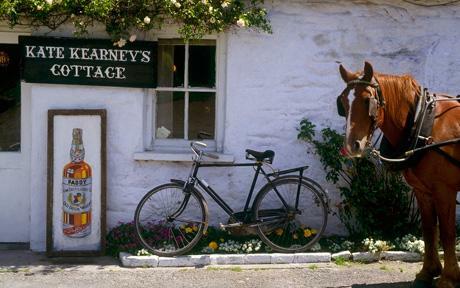 There is a sign post 16 miles in the cycle, take it, the alternative will lead you into Kenmare the extend the cycle. After turning left the ascent begins immediately but is achieveble. Arriving at Molls gap will be the beginning of the descent (mostly) into Killarney for some welcome freewheeling and scenery some of which will include a look down on alot of the area you were cycling up to now. Wow! This spin has to be one of my favourite of all times. I can’t believe I have only cycled it recently for the first time; I have been missing out. A word of warning this course is very technical and road surface is not 100% in some places, make sure tyres are in good condition. Alot of this route is remote, make sure to to have food and water so as not to be caught short in the valley itself. Most importantly, enjoy! Yeah I missed the Humpy 100 but had the same experience last year. It’s a gorgeous part of the world alright, I don’t get out that way often enough. Thank you for your posts, I find them most informative. I had a long break from cycling but got back into it this year. Just did the Ring of Kerry last Saturday and am on the roll! Signed up for Iveragh200 (130km route). Will cycle Gap of Dunloe and Black Valley this Sunday to prepare myself or Iveragh challenge in 2 weeks. Fair play to you, sounds like quite the adventure, but do you know those cycles that I have got lost like that are normally the best ones. Hi, I will be down that way soon and was wondering if the cycle would be too difficult on a hybrid cycle. Gap of Dunloe looks and sounds amazing. Done ‘The Gap’ on Saturday 29 April.route gets quite tough as you enter the gap and surface is quite poor in places.scenery is fantastic though and my conditions were perfect.would recommend doing it with somebody just for company and moral!An experience I will not forget for a long time.Enjoy but do bring drink and food as it is really remote. Hi, I’m down here in Killarney for a few days with my bike(racing bike). I’ve done the Ring of Kerry and thoroughly enjoyed it. 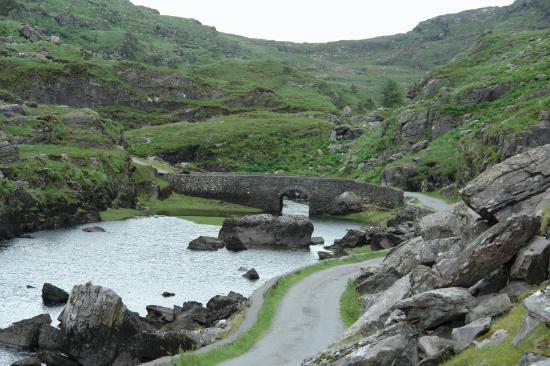 Was looking to do the Gap of Dunloe – would my bike be suitable? Yes it would be Marcas. There are some rough patches but none that can’t be traversed with a bit of care. Good luck and enjoy your cycle! Hi, did this cycle yesterday, fantastic. Cycled Killarney, the Gap of Dunloe, through the Black Valley, up to Molls Gap and down to Killarney. The scenery, flora and fauna, listening to the water – breathtaking. It’s circa 56 km and took me approx 2 hrs 35 mins, I didn’t stop and was using it as a training spin. The only thing I was not happy with was the lack of road respect the jarveys showed, apart from 2 they didn’t pull over to their side of the road which meant I nearly crashed a few times. That said it was fully worth it. A definite for your bucket list. This is one of my favourite cycles. I travel down from Tipperary on a regular basis and this route is definitely one of the highlights of each trip. During the winter months I use the Killarney to Avoca trip for training. I always look forward to the re opening of the coffee shop as its a sure sign summer in on the way. It’s then the real beauty of the cycle is uncovered when one enters the black valley and travels all the way over the Kate Kearney’s Cottage. It’s like travelling through time. I usually make it back to Killarney in approx 3 hours depending. Amazing cycle route and highly recommended. Hi Joe. A very timely comment as we just cycled this route again this morning! Tough going as I have been off the bike for a while but very rewarding and a great route alright. Very hard to beat. First trip through the black valley today. My god it was a windy one with headwind all the way once I passed Kate Kearney’s until I arrived on the Sneem road up at Molls Gap. Great sign of the times when you see the builders in at Avoca and at visitors centre at Ladies View. Ok Donnacha, must try that one next time. It seems it would add a good bit extra to the cycle. What kind of time would it take to get back to Killarney. Just done it, my fiancé said first there will be no way she can cycle even 20k, after all we completed full circle, encl few extra kms, because we got lost we have done over 60km, proud of her???? Thanks Roberto. Quite the achievement and I hope both of you enjoyed the cycle.